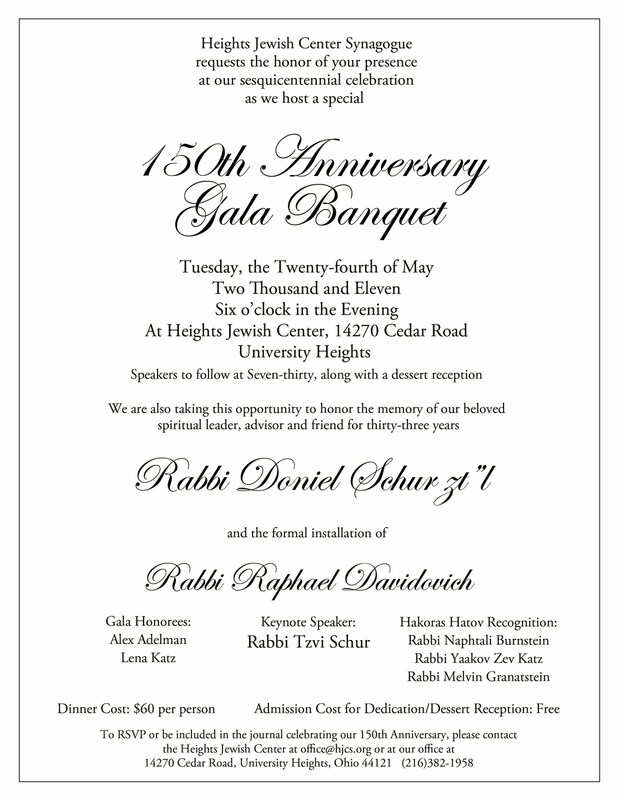 Heights Jewish Center’s 150th Anniversary Gala Banquet is just a few weeks away, on Tuesday May 24 at 6pm. After the dinner, at 7:30pm, there will be a program in the Main Sanctuary, followed by a dessert reception, free and open to the public. and formally installing me as Rabbi. who were of great assistance to the shul after Rabbi Schur’s passing. 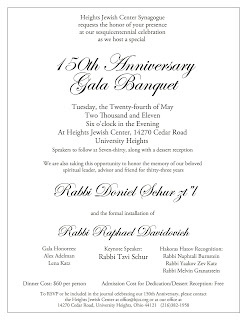 The keynote speaker will be Rabbi Tsvi Schur. We look forward to everyone’s participation. contributions and ads ensure that Heights Jewish Center as a shul can continue to contribute to the Jewish community and that Deena and I can continue to continue to give to each of you, the shul, and the entire Jewish community in so many ways. office@hjcs.org or 216-382-1958 by this Sunday. Refuah Shleima to Barbara Pinkus. Shalosh Seudos this week is sponsored by Harold And Feiga Males to honor the yohrtzeit of Harold’s father, Avraham ben Yeshaya. This week at Shalosh Seudos, we continue our insights on Chapter 5 of Pirkei Avos. In response to popular interest, we will also continue our Yohrtzeit Discussions of great Rabbis. This week we will discuss Rabbi Yitzchak Alfasi, known as the “Rif”, whose yohrtzeit is this Shabbos, the 10th of Iyar. 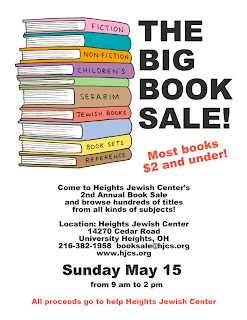 The shul’s second annual Book Sale is this Sunday May 15, from 9am to 2pm. We are looking for a few volunteers to help run the sale for whatever amount of time you can spare. 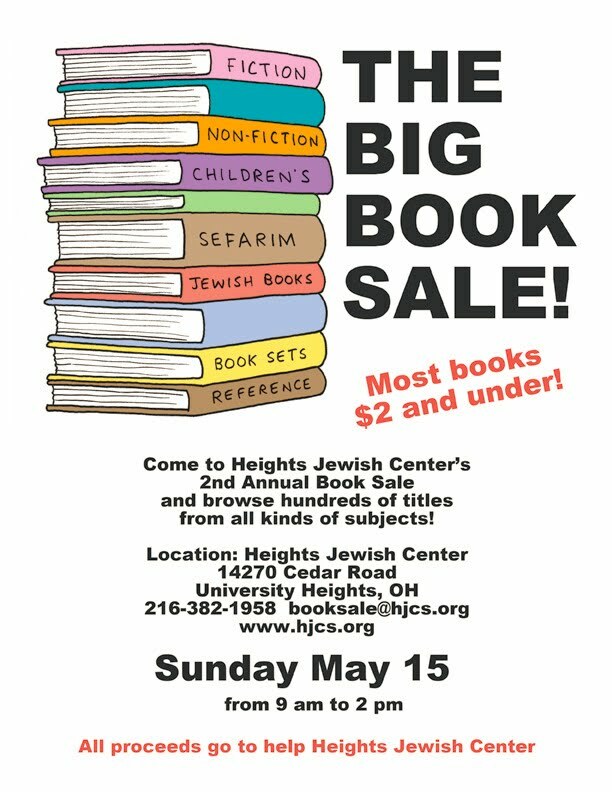 If interested, please call the office or e-mail booksale@hjcs.org. All men and women are encouraged to attend. People are welcome to the site of Bexley Park’s lot on Wrenford on Sunday May 22 any time from 9am to 3pm to bring recycled items and help with the rebuilding of Bexley Park, a beautiful playground that has been of benefit to many families in our shul and beyond. There is no South Euclid residency requirement to attend and help. Don’t forget Shema and Sefira after dark. Thursday night we counted 24 Days. According to the Mishna Berura, one may get a haircut on this Friday, May 20, in honor of the Shabbos immediately preceding Lag B’Omer. The other Sefira mourning customs are suspended only starting on the morning of Lag B’Omer, Sunday May 22.